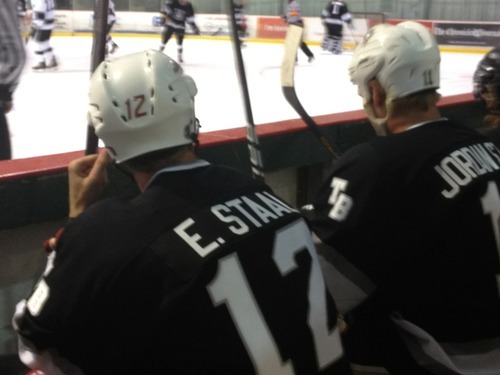 2 Staal’s on one bench! GASP! Hey — I wonder how many “too many Staal’s on ice” penalties we will have next season. I have to admit…I would giggle for a little bit. He may be married…but he’s still hot. S, I love you. Once I find the link to the interview he did today — I’ll be sure to stop your heart with that too :) Since your family is with you this week, I dont mind causing bodily harm. They’ll rush you to the hospital in time. Why is this so funny to me? I can’t for the life of me figure out why I find this so funny. I blame the sun. Today, I fell asleep on a float in the pool today and am now a lobster. Delirious. 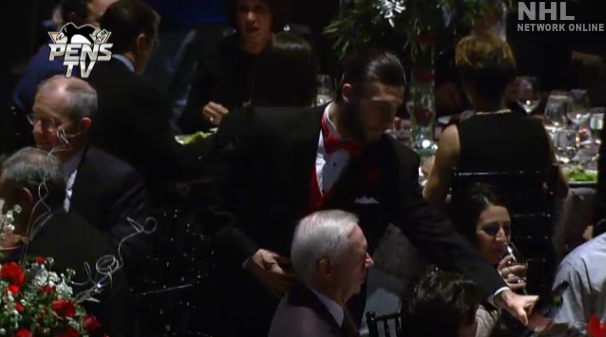 Now if only Tanger and his hair were involved in this gem. Life would be complete. I have nothing to say. My jaw is on the ground. Just watch and see for yourself. 2. 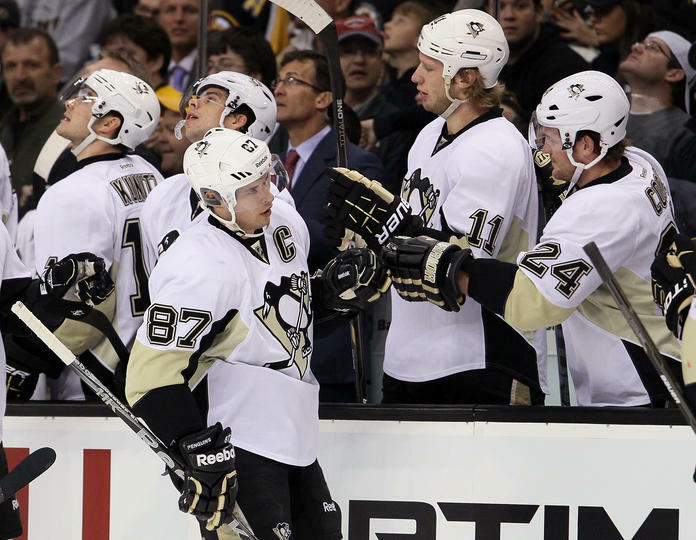 Sidney Crosby scored a goal (make that 2). duuuuuhhh. when does that NOT happen?! 3. 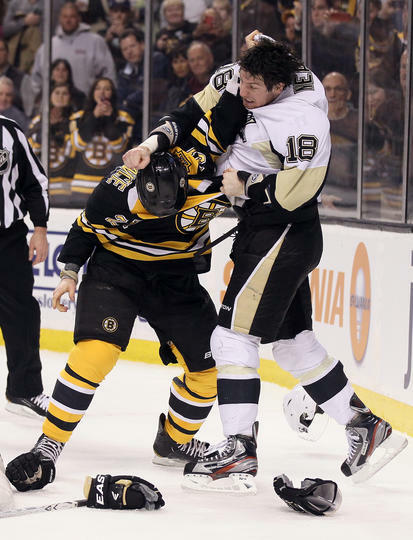 James Neal + Andrew Ference = FIGHTTTTTT! Once again, S sent me a text. “Did you just get pregnant? 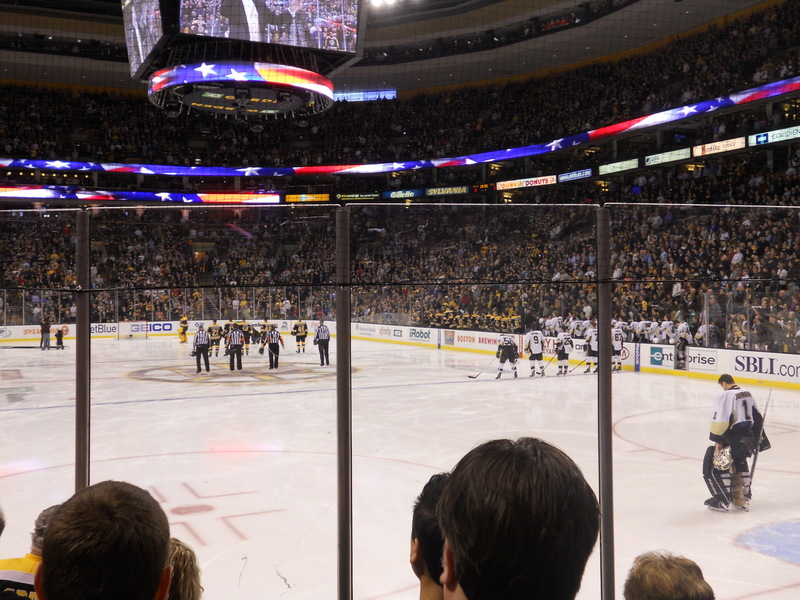 Because I think I did…” I basically had front row seats to one of the BEST things I’ve ever seen at ANY hockey game. James Neal. Fighting. Right in front of me. *swoon* And if I wasn’t busy drooling, I would have grabbed video. But I was trying to restrain myself from jumping over the glass and bashing Ference’s face in for picking on my boy. The entire game James just got under every B’s players’ skin. You know how he’s the ” little brother we all love” to the Pens? Well, he’s the “little pain in the a$$ that we all hate” to the Bruins. 4. Joe Vitale took a puck to the face. 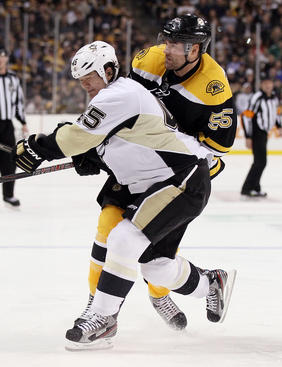 And to make matters worse — it came from Zdeno Chara…which ends well for NO ONE. But, like the amazing man he is, Big Z was the first to the scene of the accident making sure Joey was alright. Good luck, Johnny. Hope it’s nothing too serious. To make Bruins fans feel better — I hear he walked out of the arena without crutches last night. One can hope that’s a good sign. Anyway, few other small things. I feel the need to defend the 2 people I heard getting bashed the most last night (besides Crosby). 6. 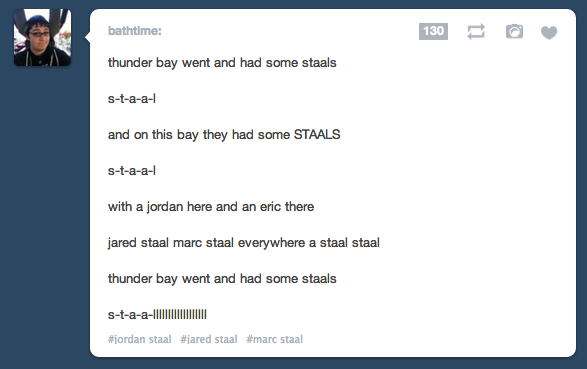 Jordan Staal is hated in Boston. Or maybe it was just my section of people. Thankfully, S wasn’t around. If she was, the bail money she set aside for me would have been used on her instead. An old woman behind me said “Someone just needs to end him for the night.” UMM — HOW RUDE! 7. Also, no one likes Kris Letang either. Look, just because he’s an AWESOME actor and can fake an injury to get a penalty called — doesn’t mean he’s the worst player in the league. That only just means the Ref’s are suckers. Welp, that’s my 2 minute break down of the madness that occurred last night. I can’t wait till next October until S & I are reunited in the ‘Burgh for a couple games. This happened the other night. One of my favorite events that the Penguins Organization puts on every season. Skates & Plates. Where the boys trade in their skates for a night and wine & dine their most loyal fans. Nealer. Oh Nealer. I can’t wait to watch the next episode of NHL36. 36 hours of you is like 36 hours of heaven. I’m so love sick it’s pathetic. How handsome are these boys in their tuxes?! I mean, really?! Could you all be anymore perfect? Red definitely works for all of you. I approve. They could serve me wine all day long and I would be the happiest girl in the world. Beard…I can dig it. The ponytail…meh…I could do without. Just let it flow, babe. Just let it flow. How to be a Perfect Dad. 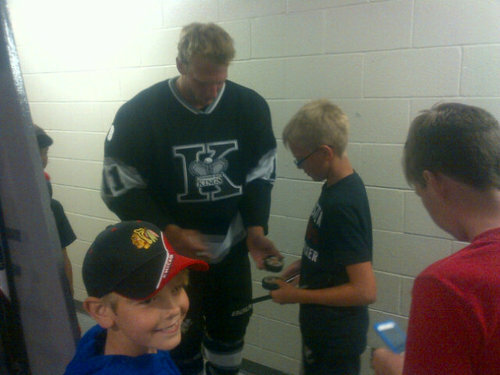 Eric Staal (and Brothers) take Parker Staal skating for the first time. (A picture surfaced a few months back…but I just noticed the video. Sorry all!) I love Parker so much, I think it’s time we give him his own tag. Bauer Hockey just posted a video tour of JORDAN STAAL’S house…aka my dream house. They must know that I just found a stray dog and named him GRONK. Or maybe it’s in honor of him making his TRIUMPHANT return tomorrow vs the Jets. Take your pick,I don’t care. All that matters is, HE’S BACK!! !